Let’s say you made short ribs recently, browning them and braising them with a copious amount of red wine and aromatic vegetables. You have, of course, saved not just the uneaten meaty bits, but the rich liquid and tender vegetables as well. So you shred the meat off of the bones (tossing the bones into the freezer for future stock-making) and toss it into a pan with the leftover braising liquid and vegetables. You add half of a big can of San Marzano tomatoes (squished up), with the juice, and a splash of olive oil. And when everything is warm and soft, you pass about 3/4 of it through a food mill. You put it all back in the pan, taste it, adjust the seasoning, add a palmful of fresh herbs (thyme and marjoram leaves, in this case), and let it continue to cook and reduce while you make the pasta. 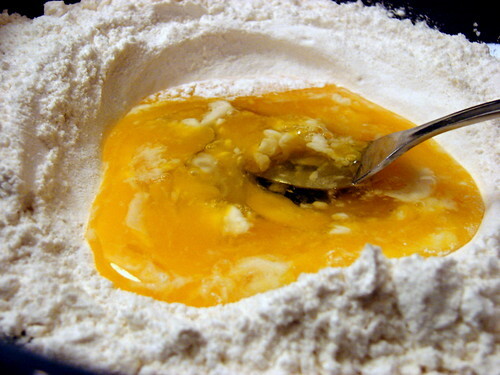 One cup of flour, a good pinch of salt, one whole egg plus one golden yolk. You stir, then knead, then roll out sheets, then slice into imperfect, rustic ribbons. You toss them with a bit of flour so they don’t stick together, then you boil them ever so briefly in salted water. They’ll cook quickly, because they’re so thin. Scoop about half of your ragu out of the pot, put it in a container, and freeze it for another meal. Then take your barely cooked pasta ribbons and add them to the pot of sauce, ladling in a bit of the starchy pasta water for good measure. Toss to coat. Turn off the heat. Add a generous amount of freshly grated cheese. No green cans allowed. Add another sprinkle of fresh herbs if you’re feeling sassy. Plate up some for your sweetheart, and then for yourself. Sit, clink your glasses, sip, taste, smile. Leftovers do not have to be boring. Did you use a pasta machine? Yours look perfect! Super duper. Incredibly delicious-looking. I usually make risotto with the leftovers, but if I have the energy for the pasta…yes! I have friends & family who won’t touch leftovers. I’ve always believed that it’s what you do with them that makes the difference. Unbeknownst to them, these folks have been served leftovers at my home & enjoyed them! I’ve privately snickered, knowing that I’ve pulled one over on them…hee hee! Here is yet another example of your talent! And, you’ve made your leftovers into 2 more meals…totally inspiring!! Many of us have suggested you write a cookbook…ever thought of doing one highlighting your amazing leftovers?? I did this the other weekend with left over pot roast! I had another question for you, I know you’re a regular at the farmers market as am I here in Providence. Last week they had duck eggs and goat meat. Ever ventured into either one of these categories? I know I’m intrigued. nevis – Thanks! I used my pasta machine (we have an attachment for our Kitchen Aid) to roll out the pasta sheets, but then I hand-cut the pappardelle. Marie – As often as I make risotto, can you believe I haven’t done a short rib version? Madness! Liz – Ah, yes! We have not yet tried the duck eggs, but we’ve been buying goat from Simmons Farm since late summer and playing with different preparations. We are huge fans – it’s got such a nice flavor, and I do want to keep working with it as long as it’s available so I can put some good goat recipes up here. Leftover short ribs? I have to make bigger batches, so I can have leftovers, so I can make a ragu. Looks divine. What is up with short ribs and their seductive nature? Cheeky monkies they are. Now that’s how you make home made pasta! Looks wonderful! 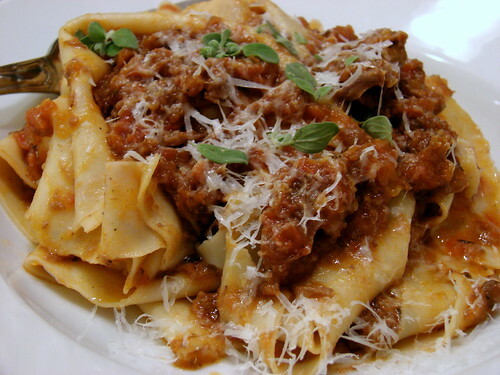 I don’t make homemade pasta often enough…. I like the way you cut yours in wide ribbons – I guess you do it by hand – do you roll the pasta in a cylinder to do it? Very nice job! I’ve never tried doing them this way, afraid they would stick and get ruined, so I use the cutter from the pasta attachment in the KA. I think wide ribbons look more sophisticated. What a gorgeous dish! I must try to make something similar. I tried your smoky pork burgers tonight. WHAT A DISH!!! It’s in my top 5 list of things I’ve eaten. And I am a keen home cook who makes absolutely everything from scratch, and who has eaten in a number of Michelin starred restaurants in London and Paris – so it’s not like someone who is impressed just because it’s better than a Big Mac. THANKS for the recipe! It is going to follow me for the rest of my life. What? Who has *leftover* short ribs? 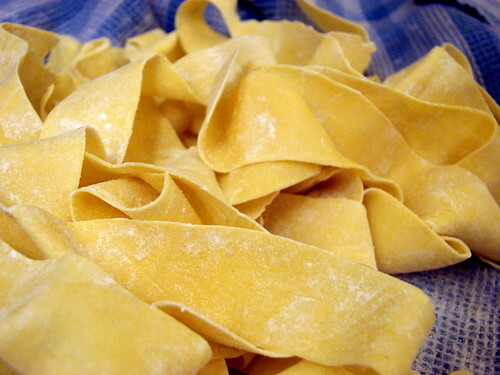 SallyBR – Yes, I roll the pasta out into sheets, then tap a small amount of flour on them, loosely roll them up and slice into wide ribbons with my chef’s knife. Once they’re sliced, I again toss with a tiny bit of flour to dry the surface out a bit before I boil them. There’s nothing I love more than short rib sugo on homemade pasta. I always try to make a bit extra when I braise meat so there’s some left for sauce. Must go buy short ribs (or lamb shanks).